Celebrate Israel’s 70th birthday as you travel to explore the history & culture of this fascinating country. Learn about Israel’s fight for independence as you encounter its historic sites, memorials & neighborhoods. You’ll also get a taste of local traditions by taking part in cultural activities integral to Israeli life. *This tour can be arranged on other dates, excluding special anniversary events. Begin your day with a visit to Independence Hall where Israel was first declared a state on May 14, 1948. Take a walking tour along Rothschild Boulevard in the heart of the “White City” of Tel Aviv. In this commercial hub, you’ll be able to see the main theater, concert hall & some of the city’s top restaurants. Stop for lunch at Maganda restaurant before arriving at your hotel for check in. Next, head out to explore the charming neighborhood of Neve Tzedek, the oldest neighborhood in Tel Aviv. Finally, enjoy a welcome dinner at Liliyot – a well-known restaurant that not only offers fine cuisine but also provides at-risk youths the opportunity to acquire training in the culinary world. Begin the day at the Ayalon Institute to learn about Israel’s struggle for independence. Here, hidden beneath a secret trap door, Israeli soldiers built a factory right under the nose of the British to produce bullets for Palmach fighters. Next, try some local bites at the Levinsky market, a showcase of Tel Aviv’s fascinating culinary history. You’ll see for yourself how immigration has influenced Israel’s cuisine, including the Balkan-style dishes from Greece & the Persian flavors from Iran. Take a guided tour of the Israeli Museum at the Rabin Center & learn more about Israel & the life story of Yitzhak Rabin, Isreal’s Prime Minister who was assassinated in 1995. Continue to the Ajami neighborhood in Jaffa for a tour about Christianity, Judaism & Islam. Take a stroll through the streets visiting different prayer houses along the way. Enjoy a traditional Arab coffee ritual in the home of a female Arab entrepreneur (Doris) as she tells her personal story of her life in Israel. Return to Tel Aviv for an overnight stay. Travel to Jerusalem to tour the Burma Road, which was created in response to the Jordanian army’s siege & blockade of supplies into & out of Jerusalem in 1948. This blockade represented a serious threat to the Jewish population’s existence when it was put into place. Continue to the Ramat Rachel kibbutz, where you can see visible traces of habitation stretching back to times of the First Temple & Judean Kingdom as well as a spectacular view of modern-day Jerusalem. The kibbutz sits on the road between Bethlehem & Jerusalem & witnessed several major battles during the 1948 Arab-Israeli war. Enter Jerusalem & head to the Old City, which was reunited in 1967 at the end of the Six Day War,  marking the first time in 2000 years that Jerusalem’s holiest site was under Jewish control. 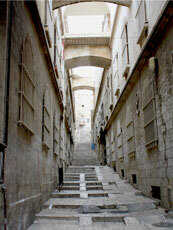 Continue with a walk along the Via Dolorosa to the Church of the Holy Sepulchre. Along the way, you’ll see the Stations of the Cross which follow the path that Jesus walked en route to his crucifixion. Continue with a rooftop tour of the Old City neighborhoods, for a look at the various communities living alongside each other in this walled city, followed by a tour of the Abu Tor neighborhood. After many years of war, Arabs & Jews have been living together peacefully here since the late 19th century. Listen to stories about the Israeli & Jordanian positions, no man’s land & the demilitarized zones the many bloody battles that took place here until the Israeli Defense Forces succeeded in conquering all Jordanian posts & entered the Old City in 1967. Return to the hotel & prepare for the beginning of Israel’s Memorial observance & have dinner. At 8PM, a one-minute siren opens the events of Memorial Day. Start the day with a tour of Yad Vashem, the Holocaust Memorial & History Museum where you can pay respects to the six million Jewish adults & 1.5 million children whose lives were taken by the Holocaust. At 11AM, expect a two-minute siren which marks the opening of the official memorial ceremonies & numerous private remembrance gatherings at each cemetery where soldiers are buried. Visit the Begin Museum & learn about Menachem Begin, a former Prime Minister of the State of Israel. At the museum, you can learn about his childhood in Poland, years as the commander of the Irgun & his time as the Prime Minister. Continue to Ammunition Hill where one of the battles of the Six Day War broke out in June 1967 between Israeli & Jordanian soldiers. The preserved site now serves as a memorial to all the soldiers who lost their lives & gives visitors a true idea of the human sacrifice involved in this conflict. Return to the hotel for dinner. In the evening, join the celebrations of Independence Day on the streets of the city center. Stay overnight in Jerusalem. Leave Jerusalem & drive to the Latrun Armoured Corps Memorial Site & Museum. At this site, you can find a large array of tanks & other armored vehicles, many of which are of World War II times. Visit the biblical landscape reserve of Neot Kedumim that hosts hundreds of varieties of Biblical plants. Stroll along the pathways & various stations & learn of the connections between the plants & their biblical ancestors. Celebrate Israel turning 70 years at the “Israel @ 70” event! Arrive at Mini Israel & enjoy welcome cocktails before continuing for a tour of the park. Dine on diverse local dishes from food stations set up throughout the park & then gather for a musical celebration. Embark on a tour to kibbutz Sde Boker to visit the hut of Ben Gurion, the first Prime Minister of Israel. Gurion, known for his leadership, moved to the kibbutz to set an example for the nation’s youth & encourage them to move south to help the desert bloom. You will also get to visit the family farms of Negev, a result of Gurion’s initiative to settle in the south. Farming in Negev was also based upon archeological evidence of settlements that existed here in the Nabataean & Byzantine periods when intensive agriculture, grape cultivation& wine making flourished in the Highlands. Meet the last of the Bedouins also known as “the sons of the desert,” who guard the ancient tradition of nomadic life in the deserts of the Middle East. Then, return to Jerusalem to experience “Shabbat of a Lifetime,” an authentic Jewish Sabbath meal, in the home of a Jewish family. Receive an informative introduction to Shabbat while savoring a five-course meal with your hosts. Depart for the Dead Sea area, stopping at the Good Samaritan site on the way. Begin the visit by learning of the origin of the name for the site which goes back to a New Testament story. The site displays artifacts which were unearthed in Judea, Samaria & Gaza & holds the only mosaic museum in the country, one of only three in the world. Atop a huge column of rock sits the fortress of Masada, legendary UNESCO World Heritage site. This was the site of the last stand by Jewish rebels against the Romans in 73AD. The remains of many Roman army camps can still be seen at its base. It is one of the greatest archaeological sites in Israel and, perhaps, across the world. Enjoy lunch & a swim at the Dead Sea, the lowest point on the Earth. Bask in the buoyant therapeutic waters of this mineral-rich sea & then return to Jerusalem to stay the night. Drive to Tel Aviv & visit the cutting-edge Innovation Center to learn about the new advancements Israeli start-ups are making in various fields, such as science, medicine, security, space & more. Finish the tour with a one-on-one meeting with an Israeli entrepreneur. Drive to kibbutz Ein Shemer & explore the roots of Israel’s pioneering spirit. Go back in time to the early days of the kibbutz, which predates the establishment of the state of Israel, to experience daily kibbutz life. Farewell dinner at a local restaurant & depart to Ben Gurion airport for flight home.